A inexpensive price makes this mop a good value overall. The Ratchet does not come with a bucket or any extra accessories. The Rubbermaid Ratchet is as simple as it comes. There are no fancy bells and whistles about this mop. Just a stick and the mop head attached to the end of the stick. Why such a simple design? Rubbermaid has other mops in their line that are more complex, such as the Reveal, but the Ratchet was designed to be their most basic mop yet. That said, this mop does give users the ability to wring out the mop without ever having to touch the cleaning head. Along the lower portion of the stick is a twisting mechanism that can be used to wring out the mop. Once users have wrung the mop out to their desired level, there is a release tab on the stick that will return the mop head back to its normal shape. The answer is yes. There is a small latch at the end of the stick, which allows users to remove the cleaning head from the stick. Therefore, users can wash and replace the head as necessary. As noted above, this is a basic twist mop. The aesthetic of the Rubbermaid Ratchet is nothing fancy and that was an intentional move by Rubbermaid. In order to keep costs low, the design had to be simple. The mopping fibers are thick blue, with a silver stick, and red / gray accents. Yep, it’s as easy as that. There is no power source for this mop. Simply push it back and forth over the mess you are trying to clean up and use water or a cleaning solution to remove the residue off of the floor. The Rubbermaid Ratchet sits at 55″ tall and 3.5″ wide. Additionally, the mop weighs 6.6 lbs. The Rubbermaid Ratchet does not come with any extra parts or accessories. The only extras users could purchase would be additional cleaning heads and a bucket. Aside from these items, the Ratchet does not need any extra parts or accessories. The following tests are designed to show how the Rubbermaid Ratchet performs as both a mop. We tested the Rubbermaid Ratchet as a mop on tile flooring, spreading three different debris types across the floor and attempted to mop the debris up over three separate passes. Each of these debris types offers a different level of stickiness and consistency, allowing us to test the Rubbermaid Ratchet twist mop against a light, heavy, and liquid substance. All three debris types are spread across our testing lane in three separate sections. Measure out 3 oz of water (dyed green for visibility) and spread the water across the back of the testing lane. Overall, the mopping tests were a success. The Rubbermaid Ratchet performed well on all three debris types we tested it against. The water test was an interesting one with this Rubbermaid mop. Instead of completely soaking the cleaning head of the mop, we decided to wring it all of the way out so that the mop could try and absorb all of the water on our testing lane. After a single pass across the water, it was clear that this plan was going to work. The Ratchet ended up soaking up all of the water we placed on the lane and was able to hold it in without dropping it on the floor as we moved the mop to our bucket. Mud was no match for the Ratchet twist mop. Although there were small bits of mud left on our testing lane after a single pass, we were able to remove all of the mud with one more pass. Honey was another interesting test. As a much stickier substance than water or mud, the honey required more water in the mop head. Reason being, more water helped to loosen the honey, allowing us to clean it off of our tile floor testing lane. While this test yielded similar results to water and mud, it was also the hardest debris for the Rubbermaid Ratchet twist mop to clean up. As we were mopping the honey, small blue strands from the cleaning head stuck onto the honey and would not come off the lane, initially. After soaking the mop again we were able to get this new mess cleaned up. That said, it required an extra step, which was less than desirable. Overall, performance was great. While we saw a slight hiccup with the honey test, the Rubbermaid Ratchet was able to overcome and remove honey with a little more water added. Is the Rubbermaid Ratchet Easy to Use? Quite frankly, it does not get any easier than using the Rubbermaid Ratchet. Well, I guess you could use a robot mop like the Braava 380t or 240, but as far as manual mops are concerned, the Ratchet is extremely easy to use. Does it take time to set up? There is no setup required with this Rubbermaid twist mop. Remove it from the packaging and put it to work. But what about the twisting mechanism? There is nothing difficult about the way this mop is wrung out. 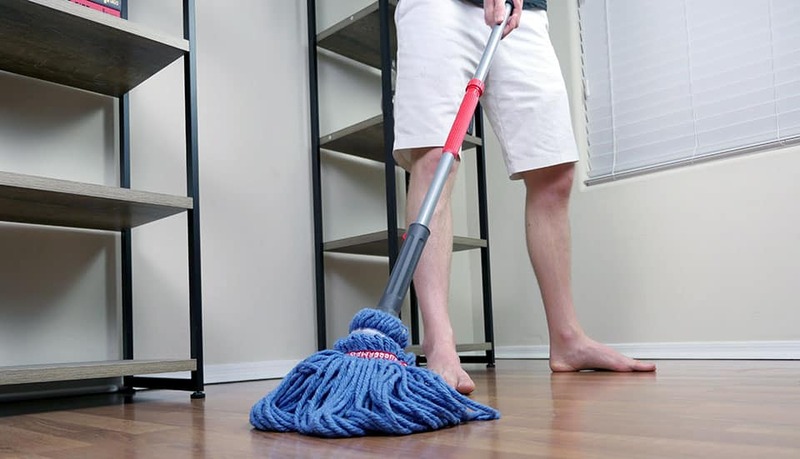 Users can see the gray twisting piece located at the bottom of the mop and will realize that once you begin twisting, the mop head will tighten up and release water. Once again, it can be released by depressing the small red tab on the twisting mechanism itself. The Rubbermaid Ratchet really goes where you go. All in all, how easy it the Ratchet to move when mopping? In general, the Ratchet twist mop moves extremely easily when being used. The lightweight design is the primary reason for the smooth maneuverability, but the ability of this mop to move through most messes without getting stuck is another great maneuverability attribute. While it is not a major issue, the Ratchet does have moments where it is not able to fit under low hanging furniture, simply due to the design of the cleaning head. All of the strands pile on top of one another, making the head too thick for slimmer spaces. If you’re looking for a mop that can fit under more furniture check out the O-Cedar Promist spray mop and Buff 18″ professional microfiber mop (or see our full list of mop reviews here). Maintaining the Rubbermaid Ratchet is as easy as washing or replacing the cleaning head as needed. There are no other moving parts on this mop, which means there are no elaborate maintenance tasks required by the user. Annual maintenance costs for the Rubbermaid Ratchet land at $8 a year. This includes replacing the cleaning head twice a year. Rubbermaid Ratchet a Good Value? The Rubbermaid Ratchet offers a good value. The low price of the mop compared to the performance you receive is impressive. During our cleaning tests, the Ratchet twist mop performed well. There was one issue we did notice where the mop head left blue fibers on our testing lane (on honey tests), but after soaking the mop head again we were able to clean up the fibers off of the lane. Maneuverability is what you make of it with this mop, which is certainly a benefit. Maintenance costs are low, as the only part that needs to be replaced is the mop head. With regard to warranty and returns, Rubbermaid offers a 1-year limited warranty and a 30-day return period (via amazon). Who Should Buy the Rubbermaid Ratchet Twist Mop? The Rubbermaid Ratchet Twist is a simple, inexpensive, and easy to use mop. It’s basic, yes, but it still gets the job done. Want a simple mop versus more advanced options – The Rubbermaid Ratchet is one of the most simplistic mops we have tested to date. There are no bells and whistles and no extra accessories included. Therefore, you will want to be sure you’re okay with such a basic mop before purchasing. Don’t mind manually mopping – As a simple mop, there is no power source with the Ratchet twist mop. Users have to mop manually, which can be beneficial for certain messes, but may be an inconvenience for some users. Want a strong performer – This mop performed extremely well during our cleaning tests. The ability to soak and wring out the mop head to your desired level allows users to clean up a wide variety of messes. For more information on the Rubbermaid Ratchet click here. Why did the Rubbermaid Ratchet score the way it did? Design – The design of the Ratchet is extremely simple. Nothing fancy. Performance – All things considered, the performance of this mop was impressive. Slight hiccup on honey, but fairly minor. Quality – Quality was nothing to write home about, but it’s a cheap mop, so it’s understandable. Usability – Easy to use, no setup required, no extra features. Value – For the price you pay, the performance is above average. The Rubbermaid Ratchet is a twist mop that’s built around a simple design. A strong cleaning performance and inexpensive price combines for a well-valued mop that can a great mop for many users. If you’re looking for a classic mop and bucket style mop, don’t want to spend a lot of money, and just want something that works, the Rubbermaid Ratchet is worthy of consideration.